This week`s post is coming to you late since it`s been so crazy with my sisters back. Plus, the holidays and all. :) But, they`re all good things. It`s tradition for my family to celebrate on Christmas Eve. I had a delicious dinner with my family last night. My sister and I each made a pie to bring for dessert and they were completely devoured! You bet I made this puff pastry apple pie! 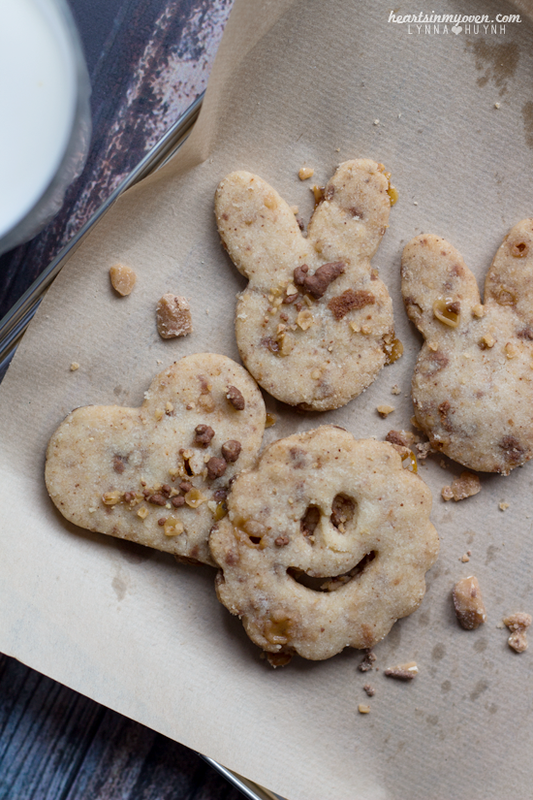 I made these cookies TWICE in the span of a week because they were so amazing. Like, these cookies are seriously delicious. I can eat them like I eat chips. And, I eat a LOT of chips. I was so surprised by how much I loved them. When I received shortbread cookies from the cookie swap from Sara, I was amazed at how addicting shortbread cookies were. I usually need to eat cookies (and most desserts) with milk. But, I could actually eat a TON of these without any milk. 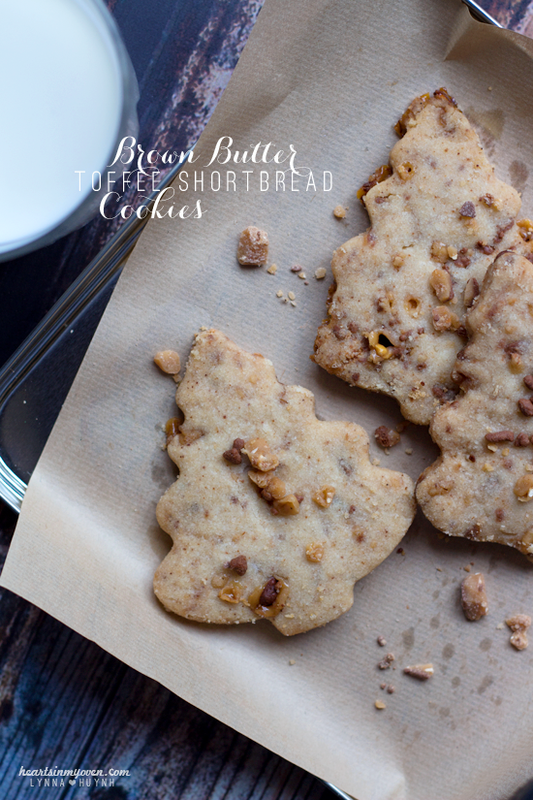 The toffee bits are a great addition to the batter. The Health toffee bits become oozing bits of chocolate and toffee scattered throughout each cookie, which I love. My dad tried one and asked for seconds and thirds. It was hilarious because he was telling my mom each time he grabbed another cookie. Haha! The fact that I made these cookies twice in a week should convince you how fantastic these gems are! 1. Line your baking sheets with parchment paper. 2. In medium bowl, whisk together flour and salt well. Set aside. 3. In a large mixing bowl, beat together the brown butter and sugar until combined. 4. On a low speed, gradually add in the flour mixture. 5. Fold in toffee bits. 6. Lay out a large piece of plastic wrap. Transfer dough onto plastic wrap and form a disk. Wrap the dough well and chill for 30-60 minutes. 7. When you're about ready to bake, preheat oven to 350°F. 8. On a lightly floured and clean work surface, roll out your dough until ½ inch thick. 9. 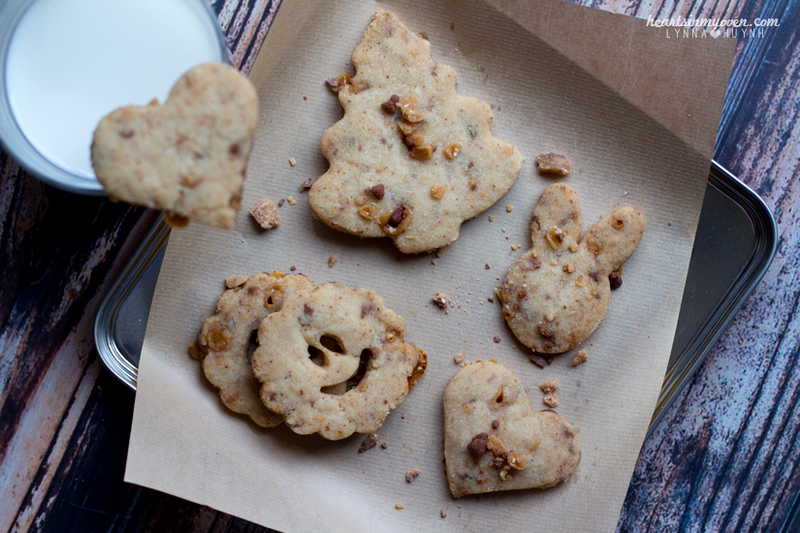 Using a cookie cutter, cut dough into shapes. 10. Place cookies on baking sheet, about 2 inches in between each cookie. 11. Bake cookies for 12-14 minutes, or until edges are lightly golden. 12. Allow cookies to cool for about 3 minutes on baking sheet, before transferring to cool completely on a cooling rack. - When you roll out your dough, it will be crumbly, but keep pressing it together. Dough will become easier to work will as you roll and re-roll the dough.